If you’ve ever experienced a comprehensive eye exam, you know that the doctor uses eye drops to dilate your pupils. But why do your pupils need to be dilated? What does that mean? The answer is fairly simple. During a normal eye exam, Dr. Brian Haas will use a bright light and a lens to examine your eye. That bright light causes the pupil to contract, a natural mechanism the eye uses to adjust to varying amounts of light. When the pupils contract, it’s difficult to see the back of your eye, where the retina, optic nerve, and many important blood vessels are. Dilating the pupils helps Dr. Haas check the back of the eye for any abnormalities. If you’ve never experienced an exam in which your eyes were dilated, here’s a quick rundown of what to expect. First, it will take about 15 to 20 minutes for your pupils to fully dilate. After the exam, you’ll have blurred vision reading vision for a few hours. Because your pupils are dilated, your eyes won’t be able to properly adjust to light. Since your pupils can’t contract, extra light will get in which can cause light sensitivity until the dilation wears off. Dr. Haas recommends bringing a pair of sunglasses (or buying a new designer pair from our Boutique Eye Optical) to use until your eyesight is back to normal. How long the effect lasts depends on a few variables, but one major contributor is the color of your eyes. Darker eye colors tend to have shorter recovery time, while lighter colors could last longer. You’ll still be able to perform normal functions almost immediately; your vision will just be a bit blurry. That being the case, you may want to have a friend drive you in for the exam, or, if you take public transportation, bring someone else along. But most people can drive fine as long as they have sunglasses. What does a regular eye exam accomplish? For starters, it aids in the detection of some common diseases (some related to the eye, some not), like diabetes, high blood pressure, retinal detachment, glaucoma, and cataracts. Healthy adults should have a regular eye exam every year by Dr. Brian D. Haas. If you suffer from diabetes or have a high risk for other optical conditions, you’ll want to increase the frequency of your exams. Many of the diseases that can be detected by an eye exam have no early warning signs, which is why regular eye exams are so crucial to your overall health plan. 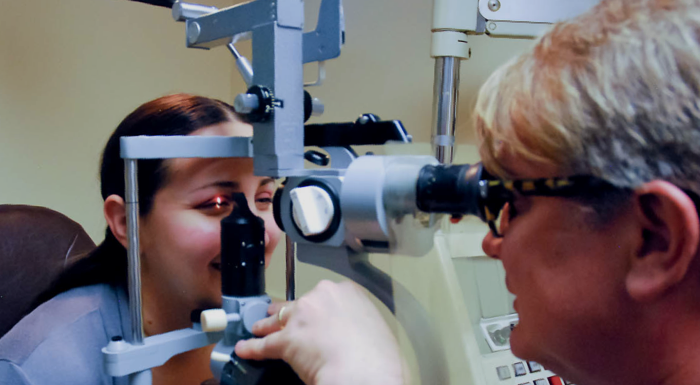 Eye exams are a safe, simple way to ensure good health, and it’s no more trouble than a few hours of blurred vision. Trust us: it’s well worth it.